Crops, Circles, and What is Happening Here? While considering what to write for this week's blog, I came upon a unusual book entitled Visit Sunny Chernobyl. I picked it up, warily scanned its contents, and on a whim, bought it. My initial hesitation came from a spontaneous horrified reaction to the thought of the long past nuclear reactor disaster. But upon second thought I decided that it was important for me to face some of the facts about what humans living on Earth really means for humans and the planet. This book by journalist Andrew Blackwell looked like a vehicle by which I could handle such serious material without slamming the book shut out of despair. Blackwell's humorous irony thinly veiled behind his experiences and researched facts proved to be what I could swallow. But what has all this to do with the crop circle image above? And, more in keeping with this blog, what does it have to do with dreams? These questions are answered by my dream of April 9, 2003 that refers both to crop circles and to our historical relationship and responsibility to the Earth and Her environmental provisions for life. Put simply, the dream refers to the early Islamic culture that contributed so much in terms of higher mathematics and scientific ecological approach to our relationship with Nature. The phonetic element, 'brasch' from the dream, I have interpreted as the ancient Germanic surname that is related to the name 'Ambrosios', meaning 'eternal life'. There was no other exact reference to this combination of letters. 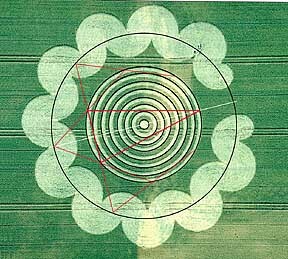 In light of that, perhaps the dream tells us that through a science based on an Earth-centred focus (represented by the beautiful crop circles that have arrived over many years now), we may gain insight into, or even experience an aspect of Earthly life that has eternal repercussions. Including the more direct references to the actual issues–oil and water–this dream addresses a crucial need to approach our Earthly existence with care, as is illustrated by the image of the Lady with the Giant Apple. Crop circles came to my serious attention when, through a synchronistic event, I discovered that a dream image that had haunted me for years was related to the crop circle phenomena. That story is told in my 'website within a website' where the dream is interpreted and its relationship to crop circles and crop circle symbols is explained. Taken seriously, the April 9th dream is an answer to the problems posed in Andrew's book. Perhaps if the matter is taken seriously by the collective, Andrew would not have any more pollution spots to visit on this planet! Andrew Blackwell. Visit Sunny Chernobyl.